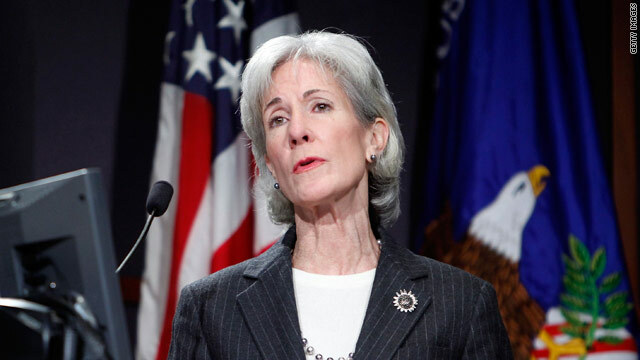 Health and Human Services Secretary Kathleen Sebelius says the House and Senate bills already incorporate GOP ideas. Sebelius: "I hope the Republicans come ready to roll up their sleeves"
Carrollton, Georgia (CNN) -- President Obama plans to use the already-passed House and Senate bills as a starting point for next week's health care summit with Republican leaders, Health and Human Services Secretary Kathleen Sebelius said Tuesday. House Minority Leader John Boehner, R-Ohio, and Senate Minority Leader Mitch McConnell, R-Kentucky, have said the current health bills should be scrapped and that any negotiation should start with a blank slate. But Sebelius, in an interview with CNN Chief Medical Correspondent Dr. Sanjay Gupta, said the House and Senate bills already incorporate many GOP ideas. She cited examples, including provisions to create special pools to make it easier for people with pre-existing illness to purchase insurance, the offering of low-cost insurance plans for young and healthy people, and regulations letting people purchase insurance across state lines -- a version of which is included in the Senate bill. Sebelius said the president's proposal is unlikely to include a government-run insurance plan that is anathema to most Republicans. The public option is part of the House-approved bill but was dropped from Senate legislation. "A lot of the Republican members of the House and Senate said on day one when this debate began that they would love to work with the president, but they could not work around the public option. Now that [we] don't have a public option, I'm hoping they're good to their word and come to the summit not just with their ideas but with a proposal. "There are a lot of good Republican ideas in both the House and Senate bills," she told Gupta. "I hope the Republicans come ready to roll up their sleeves and get to work." Without a public option, Sebelius says insurers must be willing to accept tougher regulation, limits on what they can charge and the ability to turn away people who may be sick. A former health insurance commissioner in Kansas, Sebelius said she envisions a major role for state regulators, but, "If it's not going to happen at the state level, you need some minimum oversight at the federal level -- how much they spend on health care, and how much they spend on CEO salaries and advertising." Both the House and Senate bills would require insurance companies to spend at least 80 percent of their income from premiums on actual medical care. Sebelius was interviewed in Carrollton, Georgia, where she was touring a small clinic that is part of a health system that will receive more than $7 million dollars in federal funding under the American Recovery and Reinvestment Act of 2009, better known as the stimulus plan. Her aides said the clinic is the only one in Carroll County, with its population of 107,000, that offers nonemergency health care to the uninsured. The clinic used stimulus funds to hire a nurse, a nurse practitioner and a pharmacist. The clinic is one of seven facilities that make up the Palmetto Health Council, which was also awarded $6.3 million in stimulus money to build a 21,000-square-foot facility to replace its flagship medical center in Palmetto, Georgia. Construction is planned to start later this year, and to generate more than 50 construction jobs, according to an official with the council. Despite criticism over the health care bill, Sebelius said she remains confident that comprehensive reforms will eventually pass. Still, she showed some frustration and acknowledged that opponents have largely been able to shape the debate. "It's always easier to stop something than pass something, particularly something that's complicated and comprehensive," she said Tuesday. "You can pick one or two things and hammer away, or pick one or two slightly misstated facts and convince people ... that what's false is true, and what's not in the bill is in the bill. That is part of the dynamic that is going on." By contrast, she said, the benefits of reform have largely been lost on the public. "Do you think insurance companies should stop picking and choosing who gets covered and who doesn't ... do you think small business owners should have more choice, and not (be limited to) a monopoly of one or two companies in an area ... should the working Americans who can't afford health coverage get some help paying for health care? Everybody says, 'Absolutely, I think that's a great idea.' That's what's in health reform." The proposed summit is scheduled for February 25 with the proceedings to be televised. The White House has invited 21 members of Congress, 12 Democrats and 9 Republicans. CNN's Caleb Hellerman contributed to this report.